Like her namesake, Gazelle can run and jump with great speed and grace. Unlike her namesake, she is a skilled warrior, and can kick with great power and accuracy. Most of Gazelle’s existence is tied with that of his father, the warlock known as Nicholas Scratch, the son of Agatha Harkness. Scratch inherited Harkness’ magical powers and became the second most powerful of the New Salem witches ; however, he resented his mother’s abandonment of New Salem in favor of the outer world. 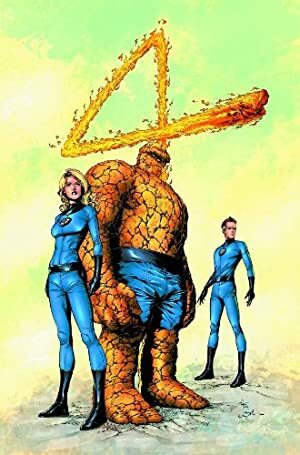 He decided to return her to New Salem to have her judged, but knew it would be a forced return ; he was also aware that she had craft with the Fantastic Four (at that time, Harkness was Franklin Richard’s nanny). 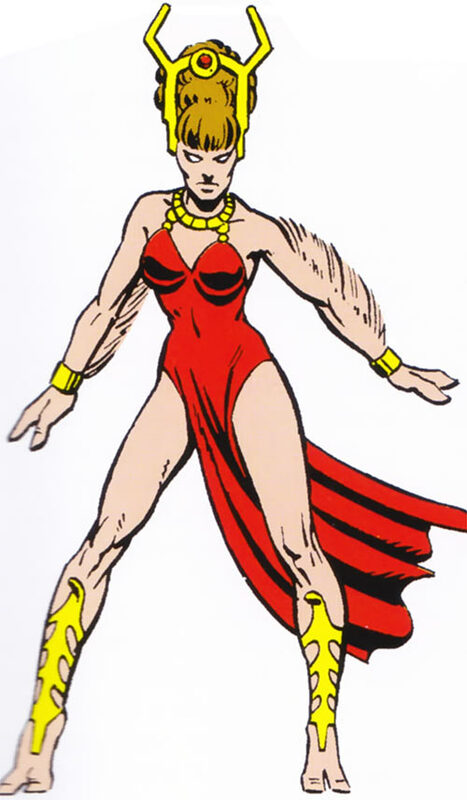 Since attempting to bring her home against her will would mean a major battle, he decided to transform his children into magical, demi-human warriors who could do battle against the power of the Fantastic Four ; his children thus became known as the Salem’s Seven, Gazelle among them. The Salem’s Seven were born from various women, and were originally just human occultists, just like the vast majority of New Salem’s population. However, all acquired the ability to transform themselves into inhuman warriors (except for Vertigo I, the only one who looks human in her super-powerful form). Scratch send the Salem’s Seven to kidnap Agatha ; they grabbed Franklin as well. Then he sent one of the powerful agents of New Salem, an Eliminator, to erase all traces of her existence, as is customary for the extremely secretive denizens of New Salem. Both actions brought the FF in direct conflict with Scratch. He and the Seven were able to defeat the FF, but he had not planned on Franklin’s unbelievable power suddenly appearing. The New Salemites turned against him and Scratch was banished into the Dark Realm. The Salem’s Seven were mystically depowered. Scratch’s next attempt had him restore the Salem’s Seven from the Dark Realm, and taking mental control of the Fantastic Four. His attempt at world conquest, however, was thwarted by Agatha who banished him more deeply into the Dark Realm and banished the Seven to New Salem. The Salem’s Seven were also instrumental in defeating the FF in Scratch’s next plan, which involved possessing Franklin Richards in order to lure the FF to New Salem. Once again, Scratch was banished and the Seven depowered by Harkness. Over the few next years, the Salem’s Seven labored to turn the spells Harkness used to depower them against her, and finally succeeded. Thus, Harkness was weakened, and the Seven regained their superhuman form. They captured Harkness, declared one of their own (Vertigo) the sorceress queen of New Salem, and burned Harkness at the stake. 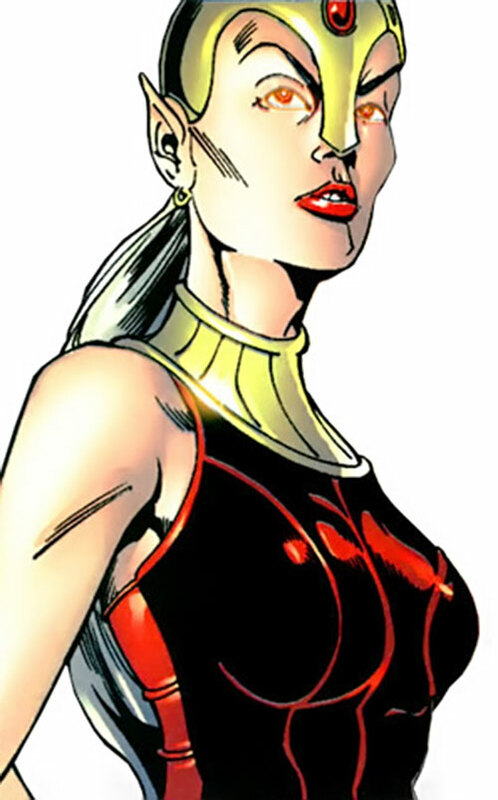 However, Harkness remained a powerful presence on the astral plane, and influenced her pupil, the Scarlet Witch, to go to New Salem. The Witch and her husband, the synthezoid known as the Vision, confronted the Seven, minus one, as Gazelle turned against her siblings due to their excessive cruelty (she was sentenced to be slain as human sacrifice for her defection). There was a magical duel between Vertigo (wielding the power of the assembled New Salemites) and the Scarlet Witch ; the Witch won and leveled most of New Salem in order to prevent a catastrophe. The Seven were killed in the explosion. However, their spirits (except for Gazelle’s) went to the plane of the god/demon Samhain and allied with him. The Vision, the Scarlet Witch and Harkness defeated them and Samhain, and entrapped them into another dimension. Gazelle is a lithe, muscular woman with two-toed hooves and a strange ridge of hair from her shoulder blades to her wrists. She wears golden jewels, and a red dress open to the waist. She wears her hair in a high series of buns above her head. Gazelle, like the rest of the Seven, is a skilled, savage warrior with a cause. However, unlike the others, she has a problem with gratuitous killing. While she’ll kill in combat without remorse, she opposes slaughter and sacrifice. There’s no need to retcon anything. Simply have Scratch drift in the Dark Realm until he comes to the fringes of the DCU, and have him summon the Salem’s Seven to rebuild New Salem in this new dimension. How his attempts at building a town of mystically-altered beings would interact with the DCU’s mystic community is an interesting question. Sentinel would be a nice choice for his initial arch-foe in the DCU.